The versatile design that is ideal for both informal and formal dining occasions makes this 5 piece dining set from RC Willey the perfect choice for any dining space. Its warm finish and clean lines contribute to its charming, classic appeal and make it one you will enjoy in your home for years to come. The Caramel collection from RC Willey offers this brown farmhouse dining table boasting a versatile design that is ideal for both informal and formal dining occasions. Its warm finish and clean lines contribute to its charming, classic appeal. The Caramel collection dining room chair offers a versatile design that is ideal for both informal and formal dining occasions. Its warm finish and clean lines contribute to its charming, classic appeal. 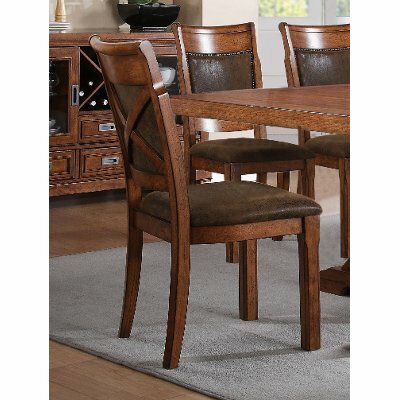 This piece features timeless nail-head trim and durable upholstery. Includes (2) 12" leaves that expands table to 102". Leaves are not stored with the table. 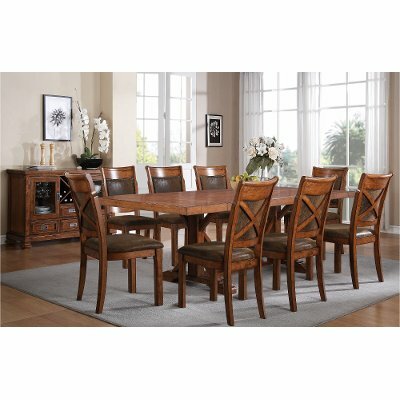 Brown 5 Piece Dining Set - Caramel is rated 5.0 out of 5 by 9. Rated 5 out of 5 by LBCDC Great Table & Chairs Had been looking for a table that would closely match a dining set I have had for years that is still in good shape. This set is very sturdy, and looks good. I have it set to the full length of 102" as I have the space in the dining room, and it accents the china cabinet and server that I already had. By the table being square on both ends, we have been able to seat 10 at the table with no problems - just add a place setting to the head and foot of the table. Would definitely recommend this set to anyone looking for a large table. Rated 5 out of 5 by Grandma13Ellie Dining Set Oh goodness, Everyone who has seen my new set loves it. The woodgrain is beautiful. The chairs are comfortable. I love how well made it is. Yea!!! PS My new rug is lovely, also. Rated 5 out of 5 by herrest Farmhouse Caramel Brown Table is very nice and solid. Chairs are very comfortable. This should last us a long time. Rated 5 out of 5 by jlrpok Love of my diningroom table and chairs I love my table and chairs. The quality is superior and the wood and leather our beautiful and very sturdy. I would encourage anyone to buy this model. Everyone that has been to my home since I purchased it has told me how beautiful it is. It's also very comfortable and I know unlike some furniture this will not fall apart. Rated 5 out of 5 by citycowgirl Beautiful dining set We love this set. It’s solid, beautiful and comfortable for our entire family to sit at. Rated 5 out of 5 by AlliCarter We love this table. We love this table. 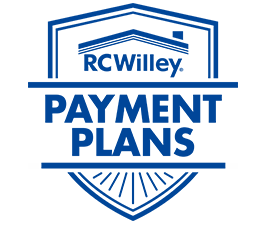 It looks great and we have received many compliments from company. Rated 5 out of 5 by Anja Caramel 5-Piece Dining Set We love this dining set. It is very well made and attractive. We added 2 additional matching chairs. Rated 5 out of 5 by Lainey This product is solid! I was so happy to find a dining set that felt strong and sturdy! The chairs that come with this set are very good size and very comfortable too! The inlay feature is beautiful on the table top and the server! It adds so much character to this set...I love it!! !